LynchyRightNow: Manny does, what Manny is paid to do . . 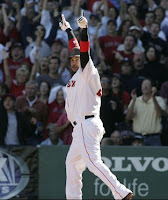 Since Manny Ramirez has been in Boston fans have adored him and been frusterated with him. After friday night's blast onto the Mass Pike in the bottom of the 9th inning with two on, I've learned one more thing about Manny, you don't insult a guy with 490 steroid free home runs, and a career batting average of .313, by walking the guy in front of him, I don't care who it is. This is why I have no problem with him standing hands held high and marveling at his moon shot while standing at home plate. Any pitcher in the league could have taken insult by watching Ramirez stand and admire his work, but you just walked the guy in front of him, and thats more insulting to me. The most homeruns Ramirez has ever hit in one season has been 45, the highest batting average he's ever had in a season is .349 with that comes a punched first ballot hall of famer card. By the time he retires he'll have hit 500 home runs, but that no longer means your a lock, what makes him a lock is the fact that after his second year in the majors, he hasn't hit less than .290 in any of the next 13 seasons. Sure we put up with some of his antics because of all this, but Manny Ramirez is like the girlfriend you decide not to break up with, no one can do what he does. One of the most amazing run producers of our generation has spent a considerable portion of his career in Boston, where I have been able to watch him win a World Series MVP, become a citizen of the United States, and be the only player to play the outfield with a water bottle in his back pocket. His swing, effortless, his brain, well I don't even venture to guess what goes on up there, but you can bet make one mistake as a pitcher and your watching 24 trot around the bases . 5. After the 2004 World Series was achieved, Boston partied like no city ever has. 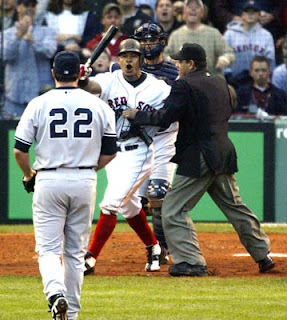 I witnessed it live, Manny Ramirez was once again playing into the fans, he was recognizing how we felt about the Yankees. Taking a fans sign and hoisting it up and down the parade route. 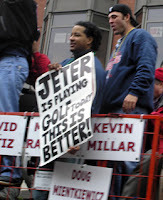 If you can't read the sign, it said "Jeter is playing golf, now this is better" all in good fun of course, but it made you even more proud to see your all-star holding that sign and giving us the best show he could. 4. May 13th, space cadet Ramirez becomes a US citizen, taking a day off to pass the exam, Ramirez returns to join the team, that night he sprints onto the field holding a small American flag, high and proud, The fans laughed and cheered the sluggers act. There is no way you could be alive and not laugh at watching ManRam run onto the field holding that little flag. 3. Instant ManRam moment, last night, first base open, Ortiz climbs into the batters box. Mike Scosia decides that seeing Ortiz flick his bat like a toothpick into the on deck circle after sending a towering homer into the bleachers is to scary a thought. 4 Pitches later, Ortiz is on 1st base, and the Angels all-world closer Francisco Rodriguez is glaring down the pipe of one of the greatest right handed hitters of all time. 5 minutes after that Ramirez is tossing his helmet off the third base line and running into the entire Red Sox team and 37,000 strong at Fenway Park are on their feet. You know what happened, it's like russian roulet for K-Rod, and Manny was the loaded chamber. 2. EVERY SINGLE TIME HE THROWS SOMEONE OUT AT HOME. Is there anyone who gets less respect as a fielder in the Major Leagues than Manny? Now I'm not saying that he doesn't bring it on by the way he seems to not hustle and pretty much have lack of concentration in the field, he's been the beneficiary of some great defensive centerfielders, Johnny Damon and Coco Crisp recently. But when you seem him play a ball perfectly and gun down the runner going home, he'll casually smile and do the classic Manny pose, to me what he's saying is "I may take off more plays than I should, but I just got you." Have you ever seen an outfielder get cheered more for throwing a guy out than Manny, people love the guy, they are amused by his antics, and will miss those when he's gone. I do need to mention this as a side note, a year ago Espn.com featured an article about what major league scouts said about some MLB superstars when they were just coming out of high school. There were two common threads among players mentioned, the first one was that Randy Johnson is an arrogant a-hole who relies only on the god given talent he posseses and refuses to adjust, the second, Manny Ramirez is the hardest working, most driven ball player coming out of high school that scouts have seen , ever. I keep that in mind every time he uses the urinal in the monster, jogs down the first baseline, and cuts off throws in from centerfield when he has no business even being that close to the ball to begin with. 1. If you haven't noticed a small thread, I love when the sox recognize the fans rivalry with the New York Yankees. My all-time favorite Ramirez moment came when Benedict Clemens decided to back Ramirez off the plate and stick up for teammate Kar im Garcia after Pedro drilled him earlier in the game. You saw a complete other side of Manny, this manny wasn't playing up for the fans, he wasn't ho-humming his way through the media, and he certaintly was anything but non-chalant. Oh no, He wasn't taking any sh*t from the future hall of famer Clemens. It's like when you have a substitute teacher who has given up on being the cool teacher because kids are taken advantage, one kid calls the teacher by his first name, and he goes off the deep end. Well that night, Ramirez was no longer the quite calm power hitter, he was going after Clemens. Gotta love that. While it lasts anyway . . . . .